Nissan estimates the Leaf E Plus range at 226 miles. The base trim of the new extended-range Nissan Leaf electric sedan could offer about 40 additional kilometres (25 miles) of EPA-advertised range compared with higher trim models, according to a test certificate from the California Air Resources Board. That would be the equivalent of the entire battery range of the Ford Fusion Energi plug-in hybrid. Nissan downplayed the CARB estimates, noting the EPA has not yet announced the official range for the new Leaf E Plus, which will be sold in the United States and Canada under the Leaf Plus series. Even so, with the Leaf E Plus blowing past the 320-kilometre-range (200-mile-range) barrier, Nissan finally has a competitive response to the wave of modern EVs produced and promised. Nissan estimates the extended-range Leaf to have an EPA range of up to 363 kilometres (226 miles), allowing the grandfather of affordable EVs to keep pace with the Chevrolet Bolt (383 kilometres or 238 miles) and Tesla's elusive base Model 3 (354 kilometres or 220 miles). Nissan was roundly chided a year ago when its redesigned Leaf debuted, focusing on the lower end of the price spectrum with a more modest battery. Having more than 320 kilometres of range is competitive for EVs today, said Sam Fiorani, vice president at AutoForecast Solutions. "The competition has raised the bar for an entry-level EV," Fiorani said. The Leaf's base S Plus trim earned a 585-kilometre (364-mile) rating under the Urban Dynamometer Driving Schedule testing cycle, according to calculations on the CARB certificate. The SV and SL models scored a 531-kilometre (330-mile) rating under the UDDS testing cycle, which simulates mostly city driving. Generally, the EPA-advertised range is rated at about 70 per cent of the UDDS range, according to Inside EVs. That calculation would peg the S Plus range at about 363 kilometres (255 miles) and the SV and SL at about 370 kilometres (230 miles). Nissan, however, is more conservative, estimating the driving range of the S Plus at up to 363 kilometres (226 miles) and SV and SL models at up to 346 kilometres (215 miles). At 1,714 kilograms (3,780 pounds), the S Plus trim is 33 kilograms (73 pounds) lighter than the top trim. The EPA calculation is meant to reflect more "real world" range because it involves five test cycles vs. the two test cycles used by California to calculate city, highway and combined efficiency ratings. "The rigor of these additional EPA tests and desire for 'real world' testing results in reduced estimated fuel economies and driving ranges for light-duty vehicles across the board," a Nissan spokesman told Automotive News. "A 30 per cent difference in estimated gasoline vehicle range is very common; an even larger difference occurs for [zero-emission vehicle] ranges." The Leaf E Plus will arrive at dealerships this spring. Pricing has not been disclosed. The Leaf, launched nearly a decade ago, cemented Nissan's reputation as a leader in electric vehicles, long before EVs were being widely discussed around the industry. Electrification goals now account for the bulk of Nissan's new product plans as it responds to an onslaught of electrified competitors. Nissan plans to launch eight new EVs and generate annual sales of one million electrified vehicles by 2022. 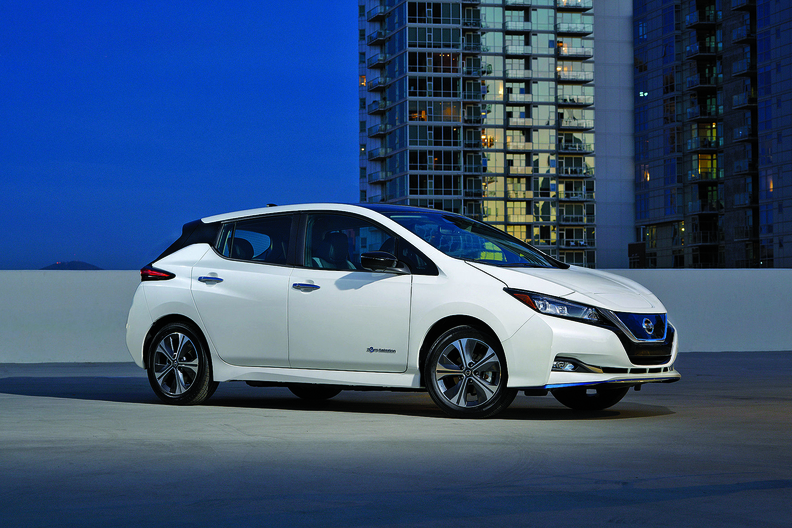 The Leaf E Plus is powered by a 62-kilowatt-hour battery pack that promises faster charging. Nissan said that with its new 70-kilowatt Quick Charging system, owners should expect to charge their vehicles in the same amount of time as short-range Leaf owners, despite having a 55 per cent larger battery storage capacity. The high-capacity battery combined with a 160-kilowatt motor in the extended-range Leaf should result in quicker acceleration at high speeds, Nissan said. Accelerating from 80 to 120 km/h (50 to 75 mph) will be nearly 13 per cent faster. The battery is physically almost the same size as that of the original Leaf, Nissan says. Other than a 5-millimetre increase in height, the car's dimensions are unchanged. It will come equipped with technologies including the ProPilot Assist semi-autonomous driving system and e-Pedal mode for one-pedal driving.